Frida Kahlo was one of the women artists that left a huge mark on 20th-century art. Her paintings shook the world and redefined art as we know it. Her life events were inspiring, but often shocking. Throughout her entire life, Frida Kahlo experience pain like few people do, and turned to a brush and canvas to draw some of her experiences. On September 17th, 1925, Frida Kahlo would suffer an accident that would completely alter her life for the worst. Accompanied by a friend from school, Frida was on a bus ride, one that crashed with a streetcar. A steer handrail pierced her hip all the way through the other side. Her pelvis, her right leg, and her vertebrae were just a couple of the bones that broke after the accident, but doctors believed it was a miracle that she survived. Blessing or curse? Before this incident, Frida has a deep passion for medicine. She wanted to combine this love with her attraction towards the arts and become a medical illustrator. The unbearable pain stopped her on her tracks, so she then abandoned the idea, and turned to paint as a way to pass the time. Since everything in her life at that point seemed to lack hope, she turned to the most available subject: herself. While her paintings are some of the most traumatic pieces of art in history, Frida never actually painted the accident. She did, however, create a painting entitled “The Bus”, and we’ll cover its significance later on. She met the artist Diego Rivera in 1928 and began a relationship soon after. After the accident, Frida has at least 30 more surgeries, so her entire life was bound to the pain and scars left by the accident. Despite their controversial love life (starting with the fact that Diego was 20 years older than Frida), Kahlo wanted a baby together with her husband. While she did become pregnant, she eventually suffered a miscarriage. This would be the central idea of one of her most traumatizing paintings “Henry Ford Hospital”. From that point on, some of Frida’s greatest paintings were centered on her pain and suffering, some even including hidden symbols that suggested the presence of her trauma lingering in the shadows. Diego and she got divorced, but the reconciled when her health was worsening. In 1935, Frida has her first solo exhibition, which she attended in an ambulance. As her condition got worse, her right leg was eventually amputated. Frida was aware that her end was near, and as she got closer to her death, she began sketching images of skeletons and angels in her diary. At the age of 47, she died due to a pulmonary embolism. 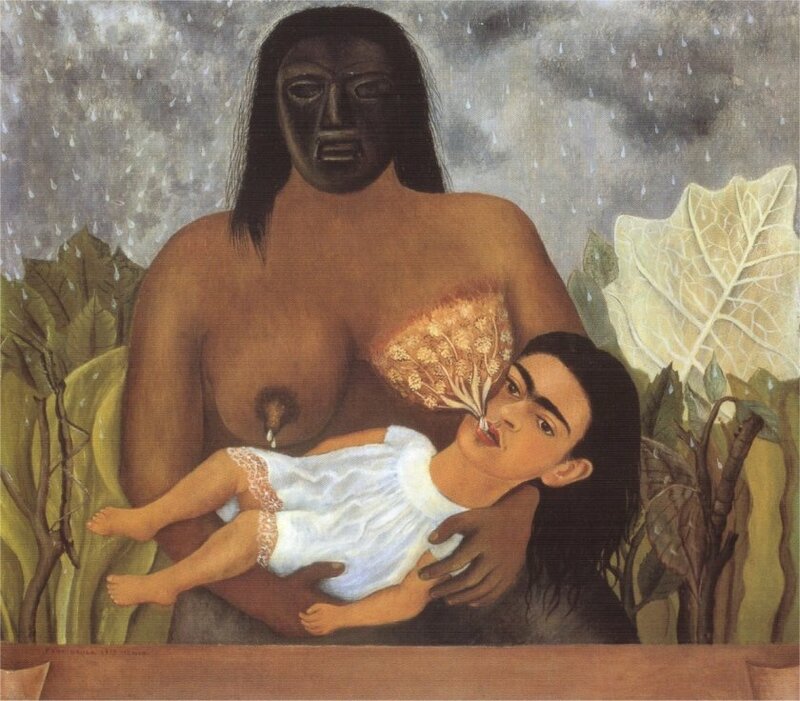 The painting shows Frida being breastfed by her native Indian wet-nurse. As one of her most popular painting, critics have long discussed the meaning behind one of her most controversial pieces. The original painting depicted Frida with short hair, but she later repainted it with long hair. The nurse is wearing a pre-Columbian funerary mask. While some claim that was due to the fact that Frida could not remember what her nurse looked like, others believed it was Frida’s interest in mixed-race genealogy that led to this choice of representation. The story behind the painting is that Frida’s mother couldn’t breastfeed her, as her younger sister Cristina was just 11 months younger. The nurse hired to breastfeed Frida was later fired for drinking on the job. Inspired by her political beliefs, Frida painted “The Bus” back in 1929. Every person that’s part of this masterpiece is a representation of different Mexican society classes. But the painting has a much deeper story than people waiting on a bus bench. One year prior to the creation of this painting, Frida has suffered an accident that left her devastated: knocked by a streetcar, Frida broke her right leg, her spine, her collarbone, three vertebrae, and dislocated a shoulder. young boy who is looking the other way and kneeling on the bench, a capitalist, and an elegant woman, who a lot of critics believe is actually a representation of Frida herself. 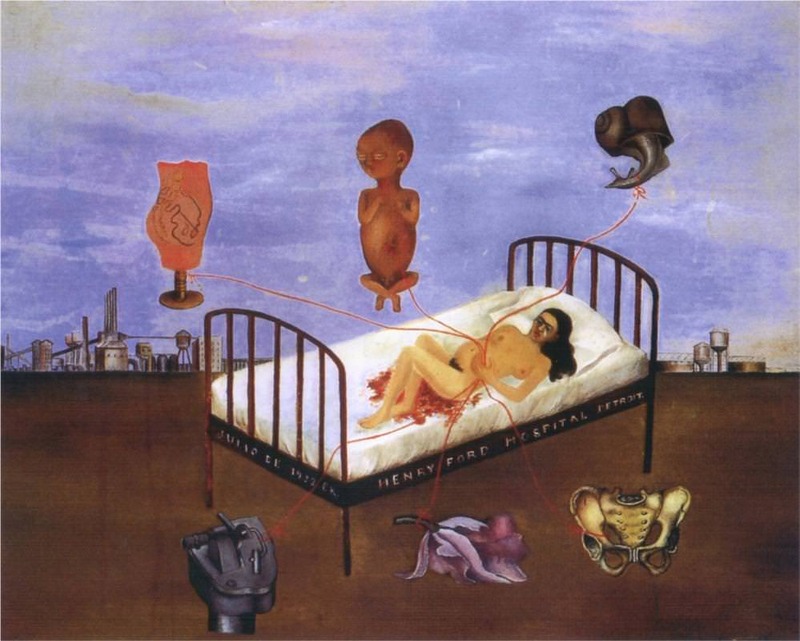 This surrealist painting made by Frida Kahlo is yet another one of her intimate works. Lying naked and exposed on a hospital bed, Frida exposes parts of her intimate life through this artwork. It is acclaimed as being one of the most painful self-portraits ever created. Frida’s body is twisted, lying on bed sheets filled with blood, connected to six objects that surround her bed. 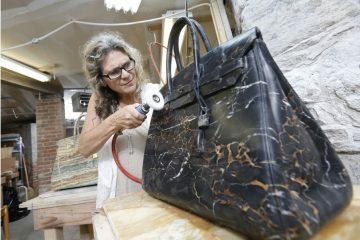 The connection is made through umbilical cords, leading to symbols that each has a deep meaning and show the impact of several elements that lead to the loss of her baby. The entire ensemble is a representation of the pain and vulnerability that Frida experienced during her miscarriage. One of the six images shows a male fetus, representing the baby that she and Diego were supposed to have. The other five symbols are a bit mysterious but are still strong in meaning. The snail represents the slowness of the miscarriage, giving an idea of how painful everything was. There is also a representation of her fractured pelvis, which was one of the reasons for her miscarriage. The purple object is a symbol of the flower that Diego gave her after the incident. The machine in the image was chosen to represent the mechanical part of the process, while the pink cast of a women’s uterus represents the medical explanations given to women in relationship to their bodies. Never has painting been given a more accurate title. Every little detail of this image is so graphic, one can almost feel the pain of the artist after the accident that changed her life forever. Nails are poking the skin across her entire body, her torso is split in half, and her spine is replaced with an actually broken column. A medical corset is wrapped around her entire body, and the lower side of the painting shows a bed sheet, which is most likely a symbol of a hospital bed. With her eyes in tears, Frida accepts her fate, covering her body in excruciating pain and waiting for her column to collapse at just about any minute. Even the background of this painting is filled with symbolic meaning. The barren wastelands are a symbol of loneliness and isolation, indicating the trauma of the miscarriage and the pain that comes along with the accident. 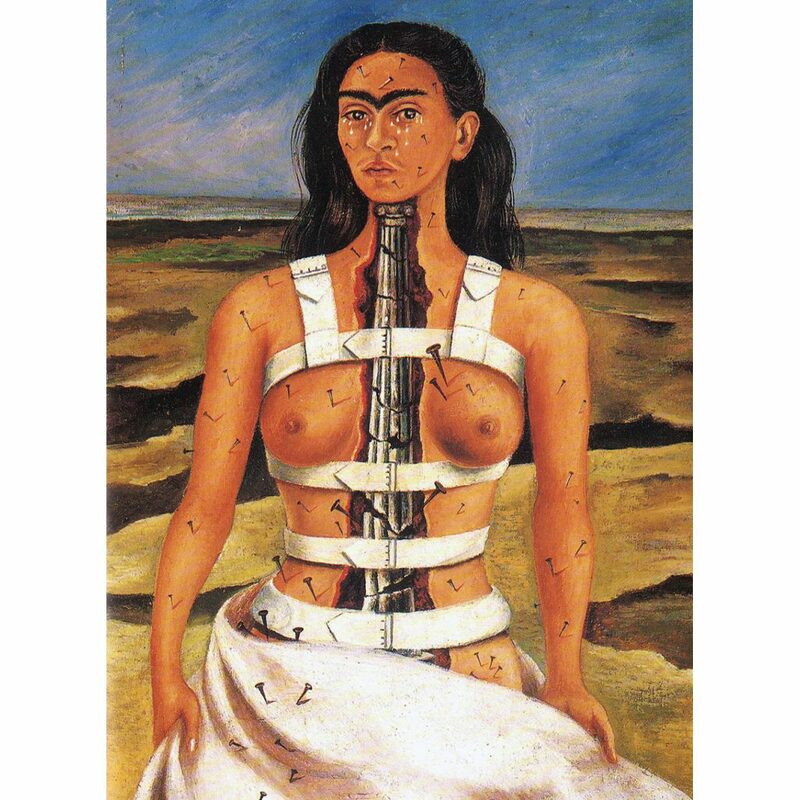 All of these Frida Kahlo paintings are the true expression of pain and trauma. “A Few Small Nips” is an artwork where blood and pain are the predominant details. Unlike some of her other paintings, Frida chose not to represent herself but rather projected her entire suffering onto another woman. The image shows a naked woman, lying nearly tortured on a bed, surrounded by blood. 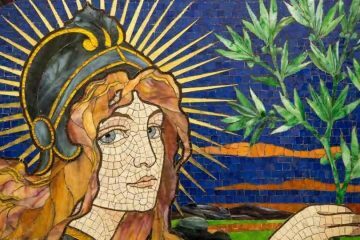 The story behind the painting goes back to a daily paper report, talking about the murder of a woman who was stabbed over and over again. The killer stated that he just gave her “a little nip”. The graphics painting bared its title on a pennant held by black and white pigeons, which are the symbol of the dark and pure sides of one’s conscience. While the image is arguably gruesome, it tells us a lot about Frida’s dark humor and her interest with the human mind and its representation of suffering. 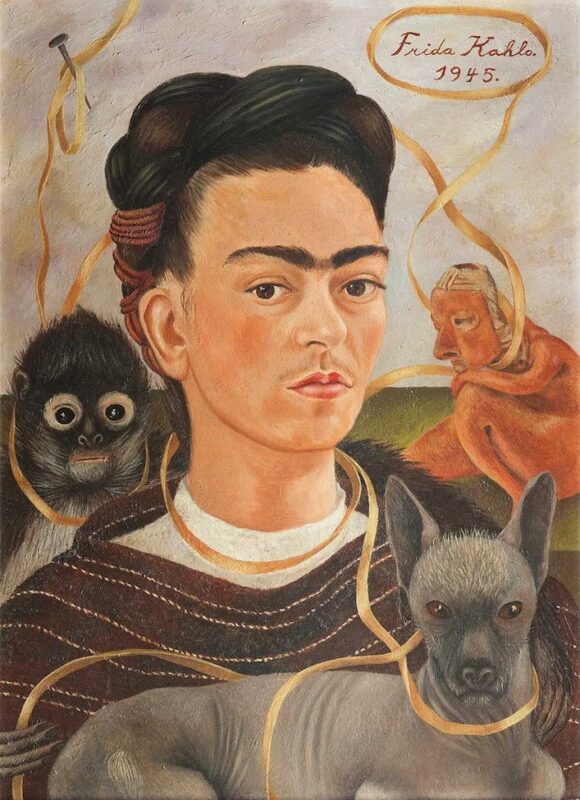 “Self Portrait with Small Monkey” is another one of Frida Kahlo’s signature painting that tells us a lot about her through an image that, at a first glance, may appear to have a random choice of details. In the garden of the Blue House in Coyocan, Frida kept a lot of pet monkeys, so nothing about the painting is actually random. Through this image, Frida depicted the monkey as a symbol of the children she was never able to have. In fact, 55 out of her 181 paintings show an image of spider monkeys. The elements chosen for this painting are clear symbols of the strong connection that Frida believed existed between humans and animals. Frida’s indigenous beliefs are seen in this painting, through representations of her dog, her pet monkey, and a pre-Columbian idol. The monkey’s arm is wrapped around Frida’s neck, while a series of ribbons connect Frida to the symbols that she so strongly believed in. 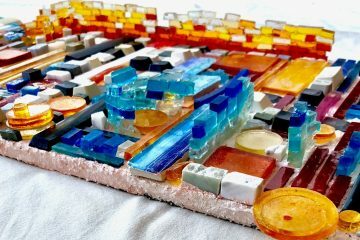 Known as her very last painting, “Viva la Vida” is an artwork out of the ordinary, considering the painful and macabre pieces she made up until that point. However, the critic eye can still see a lot of pain in this goodbye “letter”. While everything about these watermelons seems to be full of color and life, one can’t help but wonder” why watermelons. Is the choice of green and red fruit absolutely random? Experience taught us that nothing about Frida’s work was random. Green is often considered to be a symbol of prosperity and life, while red is the color of pain, fire, blood, and sexuality. 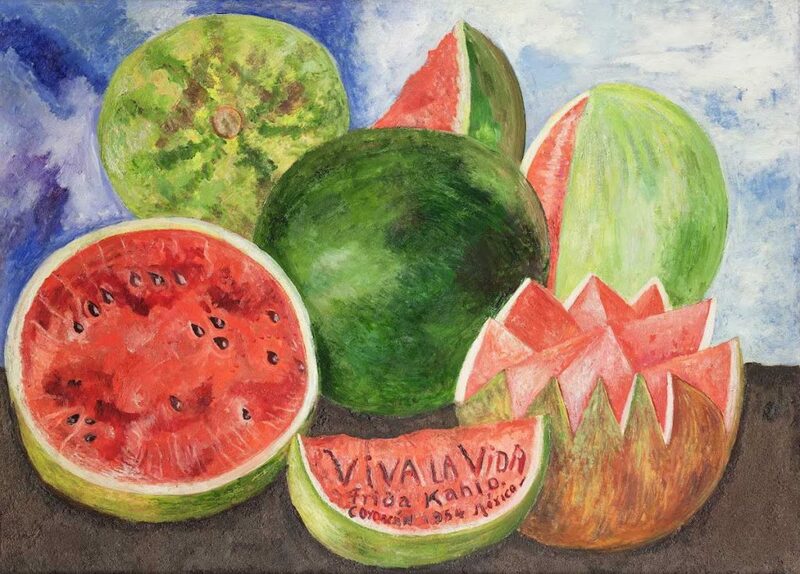 Is there any way that we can associate the meanings of these colors with some of Frida’s past paintings? I believe we can. As her final hours approached, there was very little left of what everyone used to recognize about Frida Kahlo. During the final moments of her life, Frida’s was often heavily medicated, leaving her into a semi-sleeping state. 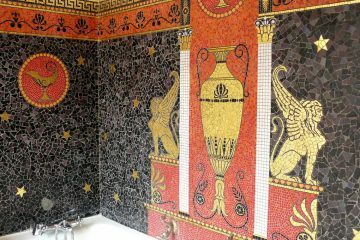 Because of that, some people dared to believe that “Viva la Vida” was not her final painting, but rather one made earlier in her life since it’s so clean. Frida Kahlo was an inspiration not just because of her work, but because of how she handled a life filled with suffering. Even if she died young, at the age of 47, the unbearable pain that she was subjected to for almost 40 years are pages ripped out of a horror novel. Nevertheless, Frida turned to paint as a way to show to the world the agony that lies in a fragile human body, and her works are analyzed and admired up to this day.